Days 35 and 36 – Cheese and Pasta – yes! So, I probably shouldn’t have said, “This is the best day ever!” before we actually made anything. But, I was hungry that morning and cheese tasting could not have come at a better time. 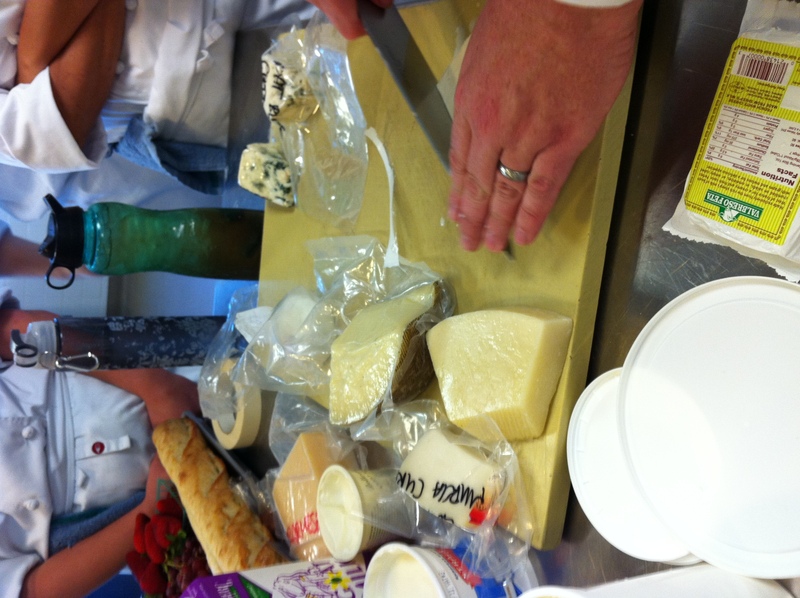 Above, Chef Tomm is slicing different goat, sheep, and cow’s milk cheeses for our tasting pleasure. Prior to that, we tasted goat, sheep and cow’s milk yogurts and milks. I am always partial to goat, so it was no surprise that the soft goat cheese (not the chevre) was one of my favorites. I also love a good “blue” so the roquefort was delicious. Additionally, we had some lovely fruit and a baguette to round out the experience, enhance and compliment the flavors of the cheese, and make for an all around lovely first 2 hours of the day. I guess I was so enamored of cheese day that I forgot to take pictures of the risotto and the bolognese sauce Mark and I made. Oh well. The mushroom risotto was ridiculously rich, but I got dinged for undersalting. Not a surprise. Rachelle even tried to save me and tell me it was undersalted, but I held my ground and didn’t win any points for it. Thanks for looking out for me, Rachelle! Rachelle also took it upon herself to taste all the rest of my items today, during pasta day, to make sure they were adequately salted. 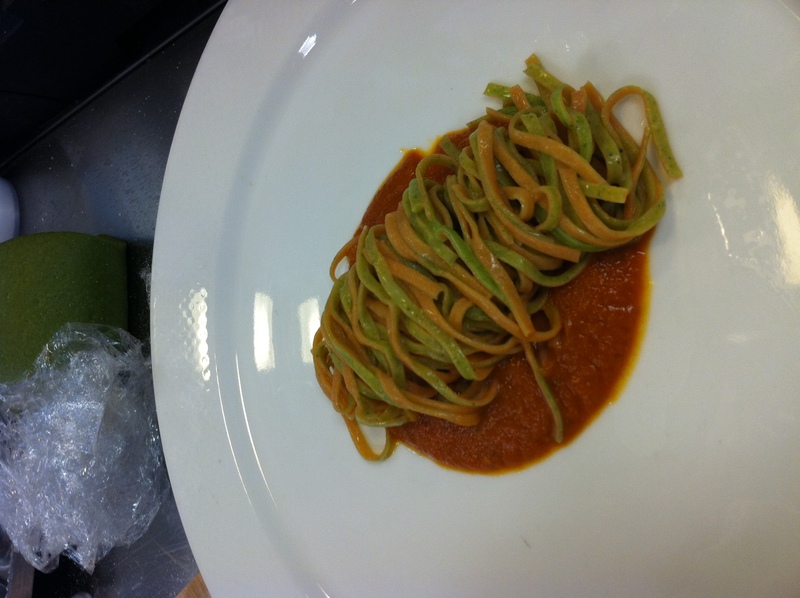 Chef Rogers from New York FCI taught us today, on a very fun pasta-making day! 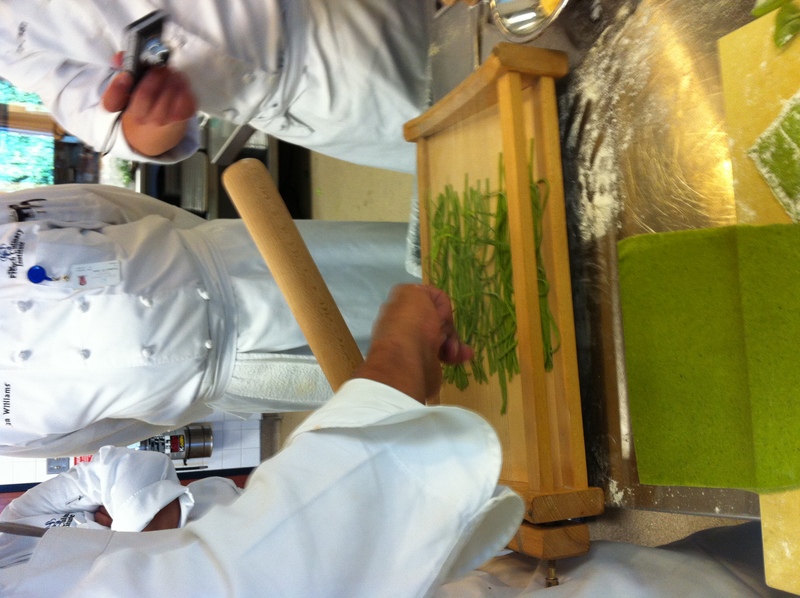 We made gnocchi, an egg pasta dough we used for our ricotta-herb filled raviolis, and spinach pasta for our lasagna. Tomas was my partner, so it’s always a great and amusing day when that happens, as that boy is funny! Again, I forgot to take pictures of our finished dishes. 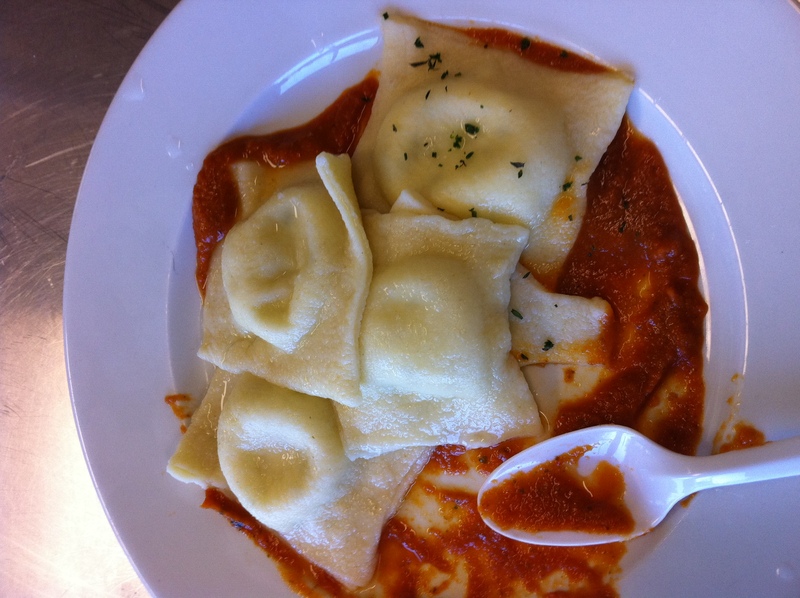 But, here’s the half-eaten ravioli dish with homemade red sauce underneath. Our pasta dough was a bit “thick” even though we ran it through the pasta machine as directed. So, maybe we’ll press down harder around the edges next time and make sure we don’t have air in with the filling. Chef Rogers showed us how to cut pasta on the chitarra and how to make dual-colored pasta, with chlorophyll in one pasta dough to give it a green hugh and lobster roe in another, that once cooked turns from green to orange-ish (both pictured, below). This weekend is ServSafe study weekend in anticipation of the test we all need to pass next week. As Bobbie put it, “It’ll be me, my servsafe book and a bottle of red on the couch.” That’s where I’m going right now. Gary Danko, I’m hoping you have a spot for me in your kitchen! I’m working your event next Monday night. ← Day 34 – Student’s choice – yippee!